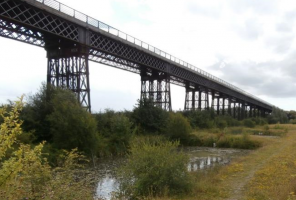 In recent months, Railway Paths Ltd (RPL), in consultation with the Friends of Bennerley Viaduct, have been assessing options to enable Bennerley Viaduct to be opened for public access and for critical repairs to be carried out to the Grade II* listed structure. As a result of this work a project proposal was put forward for the RPL board to consider. At a recent meeting, the RPL board agreed to invest the time and resources required to develop this project up to the stage where works contracts can be awarded, subject to sufficient funding being raised and the necessary permissions and consents being secured. This development work will take place between now and April 2019 and will include carrying out detailed design work, fundraising, obtaining planning permission & listed building consent and obtaining the necessary land rights. The proposed project will enable access onto the viaduct via a new ramped path at the Cotmanhay end, linking to the Erewash Canal towpath, and it will provide a deck across the full length of the viaduct suitable for a wide range of people to enjoy Bennerley Viaduct’s full 430 metre length. At this stage it is likely that funding constraints mean that it will only be possible to provide a flight of steps at the Awsworth end. Our longer term aspiration remains to also construct a ramp at the Awsworth end to enable full access at both ends of the viaduct, when funding becomes available. If sufficient funding has been raised by the end of March 2019 the RPL board will then be asked to approve progress of the project to the construction phase. Meanwhile the Sustrans Greener Greenways project continues to work with the local community to enhance the biodiversity of the area beneath the viaduct.